Tag Archives: Myeongdong is a popular shopping district for foreigners. 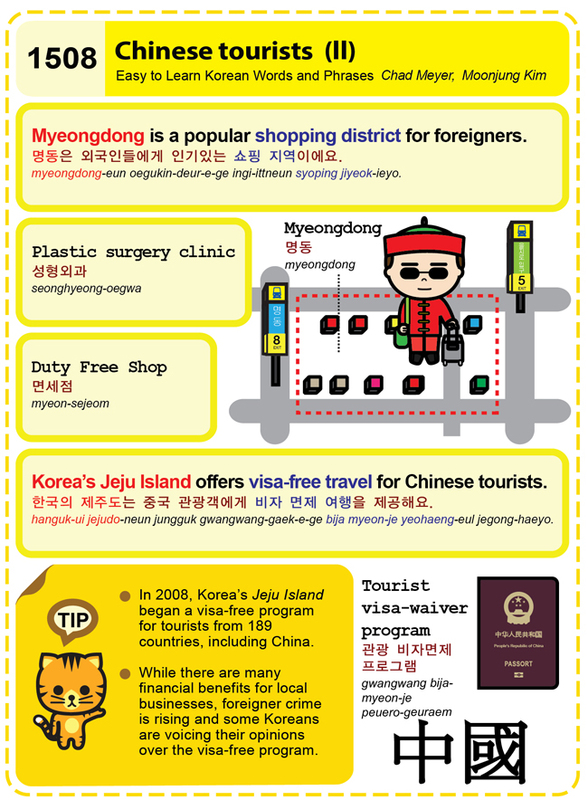 Easy to Learn Korean 1508 – Chinese tourists (part two). Posted in Series	| Tagged Chinese tourists, Duty Free Shop, Jeju Island, Korea’s Jeju Island offers visa-free travel for Chinese tourists., Myeongdong, Myeongdong is a popular shopping district for foreigners., Plastic surgery clinic, tourist visa-waiver program, visa free, 관광 비자면제 프로그램, 면세점, 명동, 명동은 외국인들에게 인기있는 쇼핑 지역이에요., 성형외과, 한국의 제주도는 중국 관광객에게 비자 면제 여행을 제공해요.